April 10, 2011 - The California Capital Airshow (CCA), a non-profit organization dedicated to promoting the importance of aviation for continued economic growth, inspiration and educational opportunities for today’s youth, and enhancing awareness for the service and sacrifice of our military men and women, announced that it is has extended the deadline of its scholarship program and is accepting applications through May 9, 2011, from all areas of California. “We are pleased to broaden the reach of 2011 scholarship program and look forward to inspiring students to pursue their dreams in science, technology, engineering, math, aviation, aeronautics or aerospace,” said Darcy Brewer, executive director of the California Capital Airshow. Eligible applicants include high school seniors, college students or returning students who have at least two years of academic college level work yet to complete. Scholarships ranging between $2,000.00 and $12,500.00 each will be awarded to students attending or upon acceptance to an accredited college, university, or vocational-technical school in the United States. Applications are not limited to a specific geographic region; California residents are encouraged to apply. “CCA would like to encourage students from Travis Air Force Base, Beale Air Force Base and the surrounding areas to apply. We simply couldn’t do a show without their tremendous military and community support; this is a way for the organization to give back to those regions,” continued Brewer. Established in 2004, the California Capital Airshow has become one of the largest and highly-respected airshows in the nation. As part of its community relations, the non-profit organization has awarded over 70 scholarships to deserving students from our region with an interest in science, technology, engineering, math, aviation, aerospace, and aeronautics. To learn more or apply for the 2011 California Capital Airshow scholarship program click link. 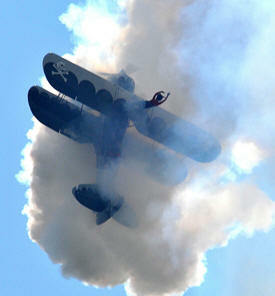 For more information about the California Capital Airshow, click link.